16:7 his appearance … height of his stature. 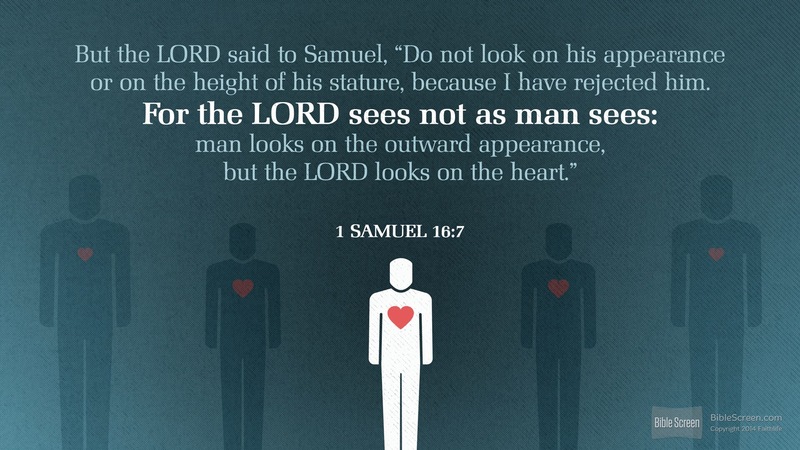 Samuel needed to be reminded that God’s anointed was not chosen because of physical attributes. This was initially a difficult concept for Samuel as he was accustomed to a king whose only positive attributes were physical. the Lord looks at the heart. The Hebrew concept of “heart” embodies emotions, will, intellect, and desires. The life of the man will reflect his heart (cf. Mt 12:34, 35). 16:7 man looks on the outward appearance, but the Lord looks on the heart. Outward appearance cannot predict whether someone will faithfully obey the Lord, for a person’s actions flow from his heart (cf. 2 Chron. 16:9; Ps. 51:10; Prov. 4:23; Mark 7:21–23; Luke 6:45; 1 Thess. 2:4). The “heart” in Scripture refers to a person’s inward moral and spiritual life, including the emotions, will, and reason. This entry was posted in Daily Devotional Guide, Verse of the day on February 24, 2017 by Truth2Freedom. If we ask anything according to His will, He hears us. Praying in Jesus’ name is more than a formula. Some people think that they have to close every prayer with the phrase “In Jesus’ name, amen.” But the proper kind of prayer involves much more than a formula. What does it mean to pray in Jesus’ name? In Scripture, the name of God embodies all that He is. When God told Moses His name, He said, “I am who I am” (Ex. 3:14). Likewise, Jesus’ name embodies all that He is. When you pray in His name, what you ask should be consistent with who He is. Praying in Jesus’ name is praying in accord with God’s will. Since God is true in everything He does, we can trust Him and His Word. God’s truthfulness is taught often in Scripture. Balaam, though no righteous man, got this right: “God is not a man, that He should lie, nor a son of man, that He should repent; has He said, and will He not do it?” (Num. 23:19). Samuel said to King Saul that God “will not lie or change His mind; for He is not a man that He should change His mind” (1 Sam. 15:29). Paul tells us, “God … cannot lie” (Titus 1:2), and “Let God be found true, though every man be found a liar” (Rom. 3:4). Jesus calls the Holy Spirit the “Spirit of truth” (John 14:17; 15:26; 16:13). Because God is true, and “all Scripture is inspired by God” (2 Tim. 3:16), it follows that His Word is completely true. The psalmist says, “The sum of Thy word is truth” (Ps. 119:160), and Jesus says, “Thy word is truth” (John 17:17). The Bible, and therefore God Himself, is constantly under attack by critics. They say God doesn’t exist. But the Bible says, “The fool has said in his heart, ‘There is no God’ ” (Ps. 14:1; 53:1). They say the world came into being by itself. But Scripture says, “In the beginning God created the heavens and the earth” (Gen. 1:1). They say the miracles in the Bible never happened. But God’s Word says that Jesus came “with miracles and wonders and signs which God performed through Him” (Acts 2:22). Always treat the Bible for what it is: the very words of God. Never deny its truthfulness, neither in your thinking nor in your living. Instead, “be diligent to present yourself approved to God as a workman who does not need to be ashamed, handling accurately the word of truth” (2 Tim. 2:15). Suggestions for Prayer: Thank God that He and His Word are absolutely true and trustworthy. ✧ If you have denied the truthfulness of the Bible, either in your thoughts or in your life, pray for forgiveness and for understanding in what the Bible has to say. For Further Study: Read 2 Timothy 3:16–17. What useful qualities are inherent in God’s Word? Meditate on these, and think of ways they can and should affect your behavior. Old Novatian said, “That in the contemplation of God’s majesty, all eloquence is done,” which is to say that God is always greater than anything that can be said about Him. No language is worthy of Him. He is more sublime than all sublimity, loftier than all loftiness, more profound than all profundity, more splendid than all splendor, more powerful than all power, more truthful than all truth. Greater than all majesty, more merciful than all mercy, more just than all justice, more pitiful than all pity. Nothing anybody can say about Him is enough…. Four basic reasons prove the necessity for people to demonstrate Jesus’ trait of gentleness. First, genuine spiritual gentleness is necessary for salvation. Jesus later instructed His listeners that “unless you are converted and become like children, you will not enter the kingdom of heaven” (Matt. 18:3; cf. Ps. 149:4). Second, gentleness is necessary because God commands it. James exhorts his readers, “Putting aside all filthiness and all that remains of wickedness, in humility receive the word implanted, which is able to save your souls” (James 1:21). Centuries earlier, the prophets agreed with James’s concern (e.g., Zeph. 2:3), knowing that without a gentle, humble spirit we can’t even hear God’s Word correctly, much less grasp and apply it. Third, gentleness is a necessity for effective witnessing. Peter tells us, “Sanctify Christ as Lord in your hearts, always being ready to make a defense to everyone who asks you to give an account for the hope that is in you, yet with gentleness and reverence” (1 Peter 3:15). Pride will always be a barrier between us and those we talk to. Lastly, gentleness is necessary because it always glorifies God. Pride wants its own glory, but gentleness wants God’s. Gentleness in relation to fellow believers especially glorifies Him: “Now may the God who gives perseverance and encouragement grant you to be of the same mind with one another according to Christ Jesus, so that with one accord you may with one voice glorify the God and Father of our Lord Jesus Christ” (Rom. 15:5–6). Oh, what we lose by not choosing a life of gentleness, by not letting the Lord grow in us what (for some) is perhaps the most unnatural of His character traits. What temptations work the hardest against your desire to personify the meekness of Christ? In his law doth he meditate day and night. I have often wished that there were some way to bring modern Christians into a deeper spiritual life painlessly by short, easy lessons; but such wishes are vain. No shortcut exists! God has not bowed to our nervous haste nor embraced the methods of our machine age. It is well that we accept the hard truth now: The man who would know God must give time to Him! He must count no time wasted which is spent in the cultivation of His acquaintance. He must give himself to meditation and prayer hours on end. So did the saints of old, the glorious company of the apostles, the goodly fellowship of the prophets and the believing members of the holy Church in all generations. And so must we if we would follow in their train! May not the inadequacy of much of our spiritual experience be traced back to our habit of skipping through the corridors of the kingdom like little children through the marketplace, chattering about everything but pausing to learn the true value of nothing? Dear Lord, help me order my time so that I may get to know You and Your Word more intimately. “We have not ceased to pray for you and to ask that you may be filled with the knowledge of His will in all spiritual wisdom and understanding” (Col. 1:9). Godly living results from being controlled by the principles of God’s Word. Paul’s prayer for the Philippians (Phil. 1:9–11) is closely paralleled by his prayer for the Colossians (Col. 1:9–12). Both epistles were written from the same Roman prison at about the same time in Paul’s life. Both prayers focus on godly living, but they approach it from slightly different perspectives. The Philippians were gracious people who needed to exercise greater knowledge and discernment in their love. The Colossians also were gracious, but their devotion to Christ was being challenged by heretics who taught that Christ is insufficient for salvation and godly living. True spirituality, the false teachers said, is found in Christ plus human philosophy, religious legalism, mysticism, and/or asceticism. Paul encouraged the Colossian believers and refuted the false teachers by showing the utter sufficiency of Christ. At the outset of his prayer Paul stressed the importance of being controlled by the knowledge of God’s will (which is revealed in His Word). That’s the meaning of the Greek word translated “filled” in verse 9. “Knowledge” translates a word that speaks of a deep, penetrating knowledge that results in behavioral change. “Spiritual wisdom and understanding” refers to knowledge that cannot be known through human reasoning or philosophy. It is imparted by the Holy Spirit Himself. Scripture supplies the principles you need to live a godly life. And the Spirit gives you the power to do so. Many false teachers will try to divert you from the simplicity of devotion to Christ by offering you philosophy, psychology, and a myriad of other hopeless alternatives. Don’t be victimized. In Christ you have everything you need! Suggestions for Prayer: Thank God for His all-sufficient Son and for the resources that are yours in Him. ✧ Ask for wisdom to apply those resources to every situation you face today. For Further Study: Read Colossians 1:15–2:23. ✧ What was Christ’s role in creation? ✧ What was Paul’s goal as a minister? ✧ What warnings and commands did Paul give? There is great need for us to learn the truths of the sovereignty of God and the Lordship of Christ. God will not play along with Adam; Christ will not be “used” by any of Adam’s selfish brood. We had better learn these things fast if this generation of young Christians is to be spared the supreme tragedy of following a Christ who is merely a Christ of convenience and not the true Lord of glory at all! I confess to a feeling of uneasiness about this when I observe the questionable things Christ is said to do for people these days. He is often recommended as a wonderfully obliging but not too discriminating Big Brother who delights to help us to accomplish our ends, and who further favors us by forbearing to ask any embarrassing questions about the moral and spiritual qualities of those ends. In our eagerness to lead men to “accept” Christ we are often tempted to present for acceptance a Christ who is little more than a caricature of “that holy thing” which was conceived by the Holy Ghost, born of the virgin Mary, to be crucified and rise the third day to take His place on the right hand of the Majesty in the heavens. The whole purpose of God in redemption is to make us holy and to restore us to the image of God! To accomplish this, He disengages us from earthly ambitions and draws us away from the cheap and unworthy prizes that worldly men set their hearts upon. MacArthur, J. (2001). Truth for today : a daily touch of God’s grace (p. 67). Nashville, Tenn.: J. Countryman. MacArthur, J. (2008). Daily readings from the life of Christ (p. 63). Chicago: Moody Publishers. MacArthur, J. F., Jr. (1993). Drawing Near—Daily Readings for a Deeper Faith (p. 67). Wheaton, IL: Crossway Books. This entry was posted in Daily Devotional Guide on February 24, 2017 by Truth2Freedom. This week GraceLife Pulpit’s pastor Phil Johnson tweeted out a link to a Nautilus magazine article in a positive light. I usually like what Pastor Johnson likes, so I thought his positive remark to the article might be worth a read. It was. The article is titled “The Anatomy of Charisma“. I first began hearing the word ‘charisma’ as a very young person. After President Kennedy was assassinated, which occurred when I was nearly three years old, the word became indelibly attached to Kennedy and then the Presidency itself. I used to hear it a lot. This Japan Times article notes that Kennedy set the bar for charisma and the Presidency. This entry was posted in Reblogged Guest Post on February 24, 2017 by Truth2Freedom.